Kamala came to our herd with a notable lingering fineness, which is not surprising from a long line of fine fibered animals. 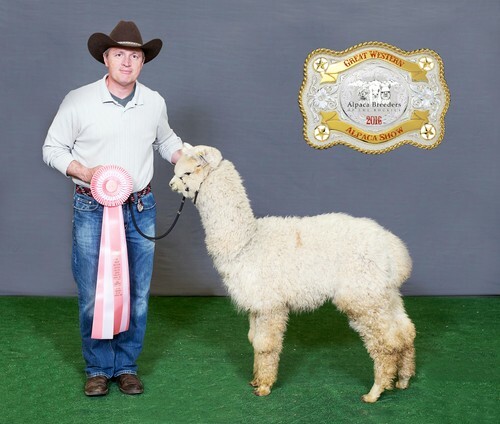 Her sire, Denver Rio Grande, is a Pperviuan Royal Fawn and Pp. Leon grandson. And her dam, Brigetta, was observed first hand to have a fine fiber still at her age! 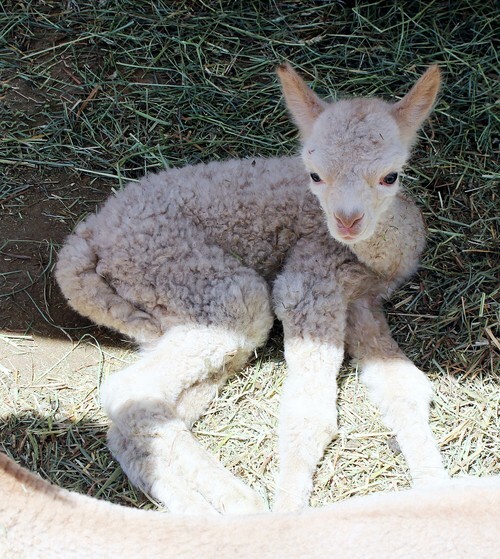 For her 2015 cria, Kamala has been bred our new stud Orionn, an Accoyo America Apocalypse son. 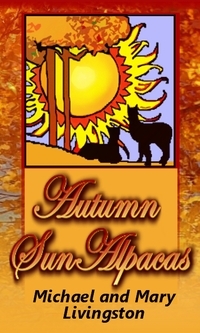 Both Kamala and Orionn have had crias with a very nice fleece -- crimpy, soft, and shiny -- in color! Yes, Daystar DOES have EXCELLENT fiber characteristics! He is white/beige with a quarter-sized brown spot on his side but his fiber is off the charts in brightness, fineness, crimp and bundling, and coverage. Kamala has been with us for a short time, but we are impressed with what she can produce. We decided to step up her game and have breed her to the fantastic Legionnaire! Full Peruvian, this boy has fantastic fiber! He has fantastic crimp style and organization on a long staple across his fine, dense blanket. His frame is perfect in conformation with an exemplary headstyle. 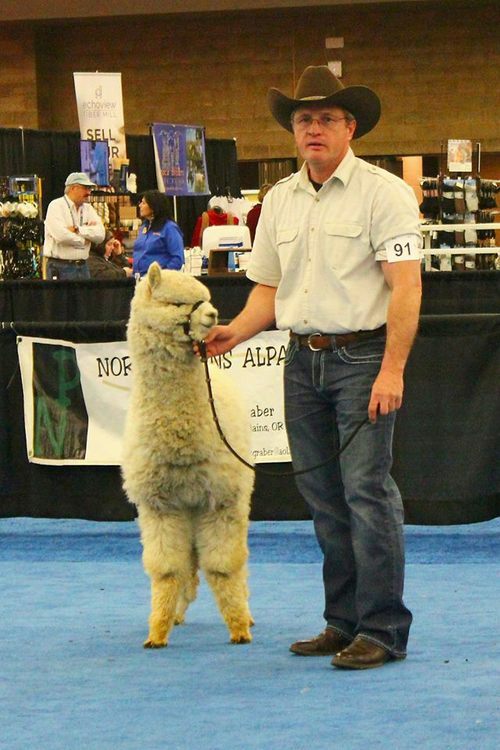 Even in his cria tips as a juvenile and with his two brown spots (an Accoyo requisite, it seems), Daystar did not do half bad for himself in the show ring once he worked out the 'kinks' of what it means to walk on a lead. 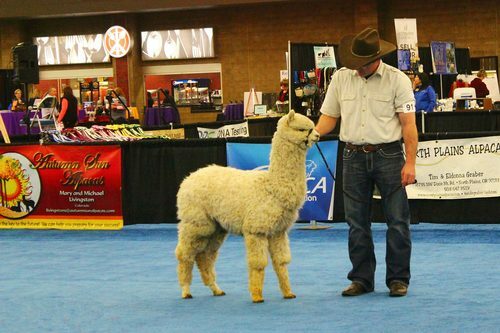 Daystar has a beautiful fleece, but in our trepidation of his little spots we entered him into the light Bred and Owned juvenile male class at his first show, the competitive AOA National Show. In his later shows, the judges did not even mention his two small brown spots we were so fearful of, and at GWAS we even braved entering him the very competitive beige halter class. Though this level 5 show lived up to its reputation of strong competition in very large classes, Daystar's fiber secured him a placing where other nice males were walked. The judge's comments after assessment and placing were favorable. Now that he has been shorn and growing in his 2nd fleece, his amazing crimp, fineness, uniformity and density are really shining through. But in the ring, he has a 'hot and cold' relationship with the judges. If and when he doesn't do well in the ring it is because if the judge does not prefer the two spots and he his dinged on 'uniformity of color'. 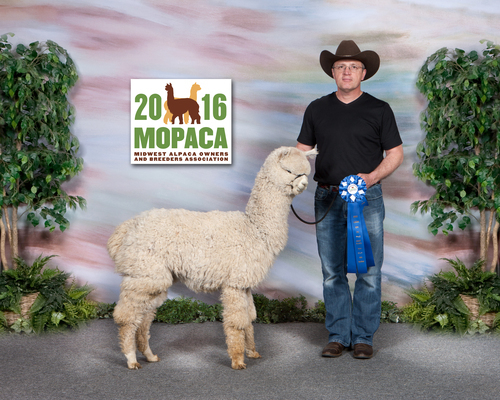 At MOPACA he secured a first in the halter class! At TxOLAN, he won 2nd in fleece! There is a lot of appreciable fiber characteristics packed on this boy and he will be awesome as a herdsire in solid (light or color) or pattern. 5th - 2017 Futurity, Light Bred & Owned Yearling males, Peter Kennedy. Tough show; not only was the judge biased against the spots, the whites/beiges/lights from the big farms made an impressive line-up. 1st - 2017 MOPACA yearling Beige males, Robin Nasemann. Daystar won over some impressive sons, with the judge's comment that he was the most dense, well put together with fineness, uniformity, style, and organization. 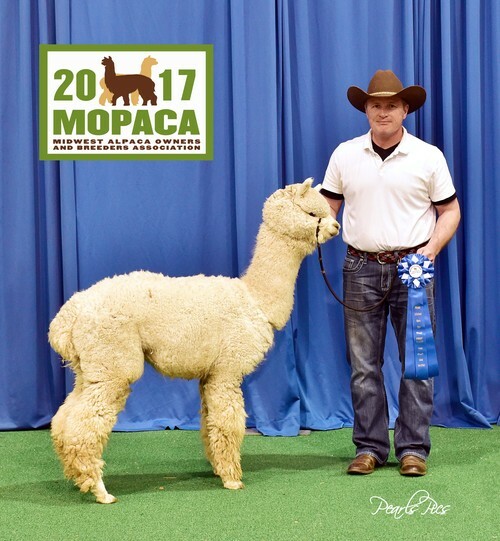 4th - 2017 MOPACA Fleece show, WHITE yearling, Wade Gease. Fourth and best handle for our BEIGE boy that was moved into white. Too bad as he would have gotten 1st and Reserve if left in beige as registered. His locks were the same or darker than the ones left in beige when we pulled sample and compared. 3rd -2017 TxOLAN Sweetheart Spectacular Show, Yearling Beige males, Amanda VandenBosh.